Swim, snorkel and skin dive -- and record every minute on the optional All Pro HD 1080P camera. 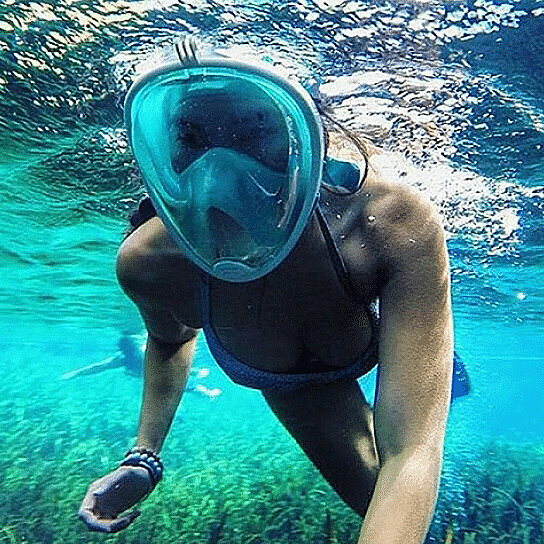 A fully waterproof companion, mount the camera on the mask to capture all of your underwater adventures. Or grab the mask by itself if you already have your own camera; the attached mount is GoPro compatible. Eliminates the need for a cumbersome mouthpiece -- no more gulping water! If you purchase the optional HD camera, youâ€™ll receive both a black 1080P camera and a waterproof case. The camera can record video or take still photos, stored on an SD card (not included). The camera comes with the full accessory kit and rechargeable battery. The camera mounts on the mask and will record continuously for 2 hours before needing to be recharged.